This award-winning DVD covers a lot of ground very comprehensively - and now has subtitles in Spanish, French, German and English (for the deaf). Among the many highlights are interviews with Dr. Caldwell Esselstyn, Dr. Neil Pinckney, Dr. Ruth Heidrich and Dr. Joseph Crowe. Dr. Crowe and Dr. Esselstyn are from the Cleveland Clinic Foundation and know something about heart disease. These interviews will convince you that cardiovascular disease, the #1 killer in America today, can be reversed by making simple changes to your diet. What you will get is a virtual one-on-one consultation with some of the world's leading authorities on heart disease reversal. You will also hear from Dr. Heidrich who treated her breast cancer by simply changing her diet. The DVD also covers a wide-range of other health problems, including the reversal of adult-onset diabetes with diet. It also covers the impact of typical Western diets on the environment. 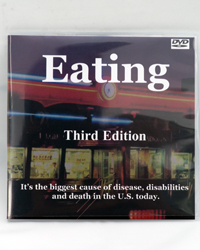 The Eating DVD is used in hospitals and wellness clinics throughout the world to motivate people to change their diets and restore their health.